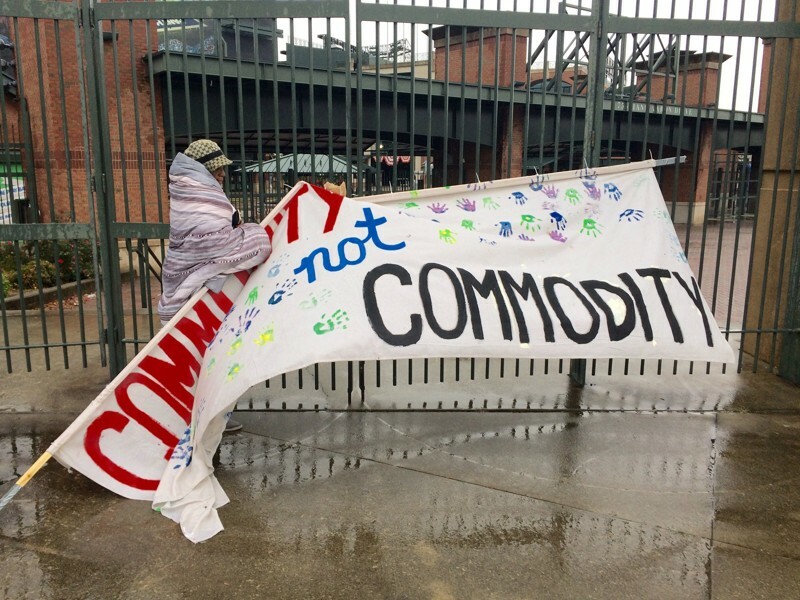 ATLANTA, GEORGIA -- More than 40 residents of four of Atlanta’s historically black neighborhoods surrounding Turner Field (Peoplestown, Summerhill, Mechanicsville and Pittsburgh) are now in day 10 of a tent city occupation at the site of the former Atlanta Braves stadium in their fight for an accountable community benefits agreement. The fight is quickly becoming a national battleground between community-led organizing for equitable and fair development versus publicly supported luxury development taking place across the nation. Last year the City of Atlanta sold the public stadium site to Carter Development and Georgia State University. Despite countless asks they have refused to meet with residents and resorted to spreading lies through the media about residents intentions, including implying that all residents want is a cash payout. Such a request has never happened. On Monday residents will get a lift from students of Georgia State University who are organizing an action to call on GSU President Mark Becker to support local residents demands and urge Carter to negotiate a CBA. #TentCityATL is the latest in what are becoming increasingly regular and escalated fights led by working class communities and communities of color to push back against privately funded, publicly supported luxury development across the nation. In March, teenagers from Boston’s Egleston Neighborhood led a 3-night sit-in at the Mayor’s office to demand increased affordable housing and community engagement for development projects in their neighborhood. On March 31, Pittsburgh residents announced a major victory in their campaign to stop the the replacement of 300 units of affordable housing in the historically black East Liberty neighborhood when they got Whole Foods to back out of the development. Some Atlanta residents aren’t waiting on the city, and are taking the fight to the ballot box. Tanya Washington -- a Peoplestown resident currently under threat of eminent domain related to the Turner Field development -- announced Thursday, she will run for city council after discovering that the city council member that represents her neighborhood has received campaign support from Carter Development. There has been push back. One needs to look no further than the Peoplestown Next Door website to see all kinds of wild accusations about the #TentCityATL efforts. Although the draft Community Benefits Agreement has zero asks for pay out to individuals or organizations, newer white neighbors continue to claim the effort is about a cash grab. The reality is the Carter and GSU stand to extract billions of dollars from the up and coming neighborhoods and while this might excite already affluent homeowners it has produced a palpable anxiety amongst long term residents that have called these communities home for generations. Monday night, a number of students and long term residents held a sit-in at GSU president Mark Becker’s office hoping to facilitate a meeting between Becker and longterm residents. Becker refused and instead had folks in the group, including former state house rep Douglas Dean , who has lived in the Pittsburgh neighborhood for over 50 years. As this blog post is being published, they have yet to be released. One of the things we often hear is that gentrification is inevitable but around the country regular everyday people are fighting back and winning. #TentCityATL is a line in the sand around the issue of gentrification and mass displacement. At its core is the notion that those that live in a community should have a voice in what happens in it, that residents are not disposable, that there can be room for everyone to survive and thrive. What can people do to support #TentCityATL?